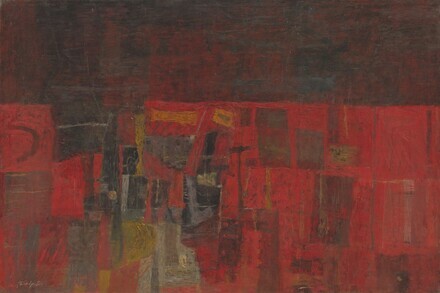 Studio of the artist [1913-1980]; by inheritance to his wife, Musa Guston; her estate; gift 1992 to NGA. Philip Guston: Working Through the Forties, University of Iowa Museum of Art, Iowa City; Greenville County Museum of Art, South Carolina; Munson-Williams-Proctor Institute Museum of Art, Utica, New York, 1997-1998, no. 14, repro. Philip Guston, peintures 1947-1979, Kunstmuseum Bonn; Württembergischer Kunstverein Stuttgart,; National Gallery of Canada, Ottawa; Musée national d'art moderne, Centre Georges Pompidou, Paris, 1999-2000, unnumbered catalogue, repro. In the Tower: Philip Guston, National Gallery of Art, Washington, D.C., 2009-2010, no cat. Ashton, Dore. Philip Guston. New York, 1960: 33, repro. Storr, Robert. Philip Guston. New York, 1986: 21, no. 17, color repro.